Recently, my wife called me at work one day saying that there was something wrong with her car. We had just driven in it the day before, and everything was fine. Now, it was making a terrible grinding noise. I only work a few minutes from home so I went home during lunch to see what was going on. It didn’t take long to find that the problem was coming from the driver’s side right wheel area. Something was grinding somewhere as an awful squeal was present any time the tire turned. I called my father-in-law as he’s pretty handy with cars. I narrowed it down to either: Something was wrong with the brakes / wheels or something had gotten lodged somewhere. I asked him about whether I should: Use the jack and such to remove the wheel or take it to the nearest tire shop. He had some stuff to bring over anyways (at least that’s what he said, I think he just wanted to come visit his grandkids whom he hadn’t seen in a while *lol*) so he volunteered to come by that evening. He has a hydraulic lift and an electric air wrench, so he was able to get the tire off in less than a minute. After looking around, we found that something indeed had gotten lodged between the rotor and the backing plate. 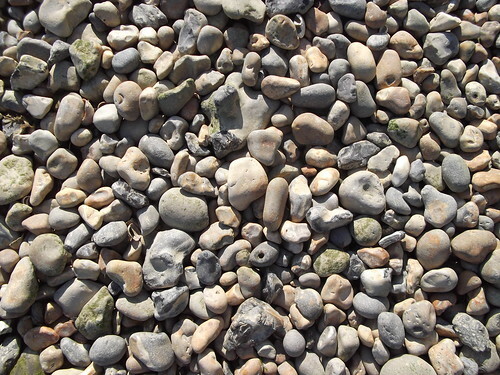 It was a pebble. A pebble about the size of the head of a pin. In other words, tiny. Yet the sound that this little pebble made was enough to think that the entire wheel was going to fall off. It was that loud. The first thing I thought of was that it was like a kidney stone. Really tiny yet really able to pack a punch (and produce wailing sounds as well *lol*). Have you ever had something that made it sound like a lot more was wrong than really was? When I was in a car accident, I got bone bruises on my ankle and shin. I even went back for additional x-rays at one point, certain something was broken and it had been missed in the initial ER visit. Nope. Just really, really bad bruises. Sadly, my car problems always turn out to be bigger than I expect. Funny. My wife has had so many kidney stones we've quit counting. Currently the water on our fridge isn't working. There's ice and the self test says everything's a-okay, but just a hum when I press the water button. So, I just got off the phone with the guy for a $55 house call Wednesday. I hope it's just a pebble, dude. Kidney stones are not cool. I needed a replacement part for our inop. garagevdoor opener. Sears service was about to order when a supervisor came from a back room with a replacement part that was a spare for them. He said Merry Christmas and there was no charge. He only saved be $8 but I appreciate this kind gesture. Good think you caught it the way you did… I know of one person who didn't, and they took their car to a less than honest dealer (I know… hard to believe they exist in the car world too) and they did a brake job! Far more expensive. It's Amazing how something so small, can cause such a huge noise. It's a lot like life's annoyances…they're so small and easy to get rid of…once you take the time to do it. Yeah, I've never had kidney stones, but I have had my share of auto horror stories. I have also had this experience while camping. In the dead of night in the woods, ever sound is magnified. A tiny little scuffle outside of your tent might seem like a menacing grizzly after your food supply, when in reality it is only a harmless chipmunk scuttling around your campsite. Perception can be a dangerous animal! Ugghh, "kidney stone" conjures such awful mental images!! I'm glad I've never had one, though I've definitely had awful cars.